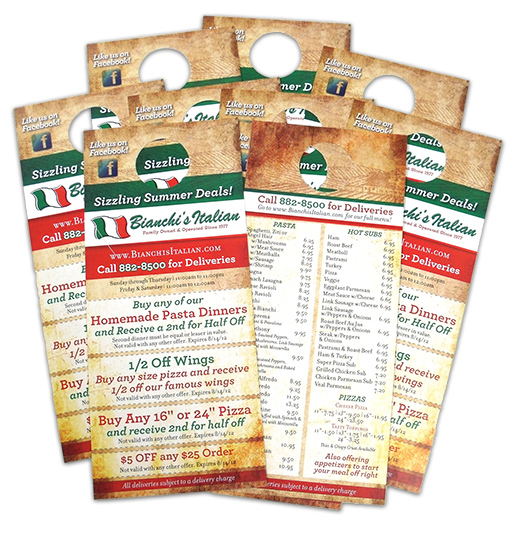 Bianchi’s Italian canvassed the neighborhoods near them with door hangers we designed and produced for them. It needed to be eye-catching and it had to hold a lot of information. Bianchi’s is another Tucson original, first opening in 1977 and now run by their son. Using some earthy imagery evoking old Italy and sharp use of the green/white/red of the Italian flag resulted in an attractive door-hanger. Each coupon is readable at a quick glance. Just looking at it makes me want some garlic bread for a mid-afternoon snack.